First off I just wanted to say a big thank you to everyone who left me wishes on my last post, they are so appreciated and so thoughtful. You are really lovely people so thank you. I will keep you updated next week after my procedure. 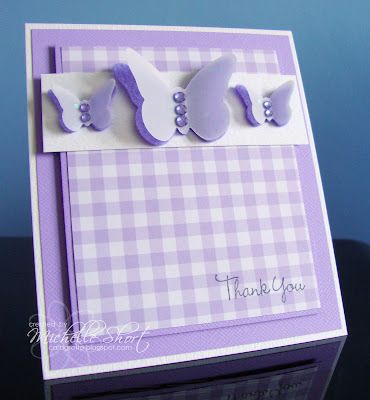 I managed to make a quick card today after seeing the lovely sketch over at Clean & Simple. I have first added DB Fairy Dust CS to a white card blank followed by another layer of the CS with a sheet from the WRS Gorgeous Ginghams pack; this layer has then been adhered to the bottom layer with 3d foam pads. A white cardstock layer added on top with the butterflies. 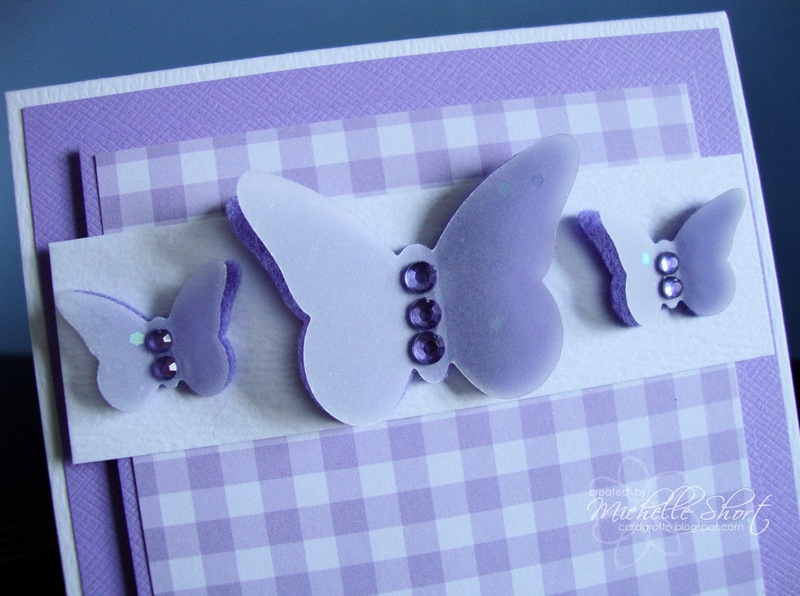 I have first cut out the MFT Die-Namics butterflies with felt and then with sparkly vellum (yes I am loving using this again, it has been in my stash for years!!) and adorned the middles with Bazzill Jewels. The greeting is from the MFT Framed Greetings Stamp & Die Set. STAMPS: My Favourite Things. INK: Memento Tuxedo Black. CS: Craftwork Cards, Doodlebug Designs, Wild Rose Studio, 100% Wool Felt, Paperchase Sparkly Vellum. TOOLS: My Favourite Things Die-Namics. EMBELLISHMENTS: Bazzill Self Adhesive Jewels. 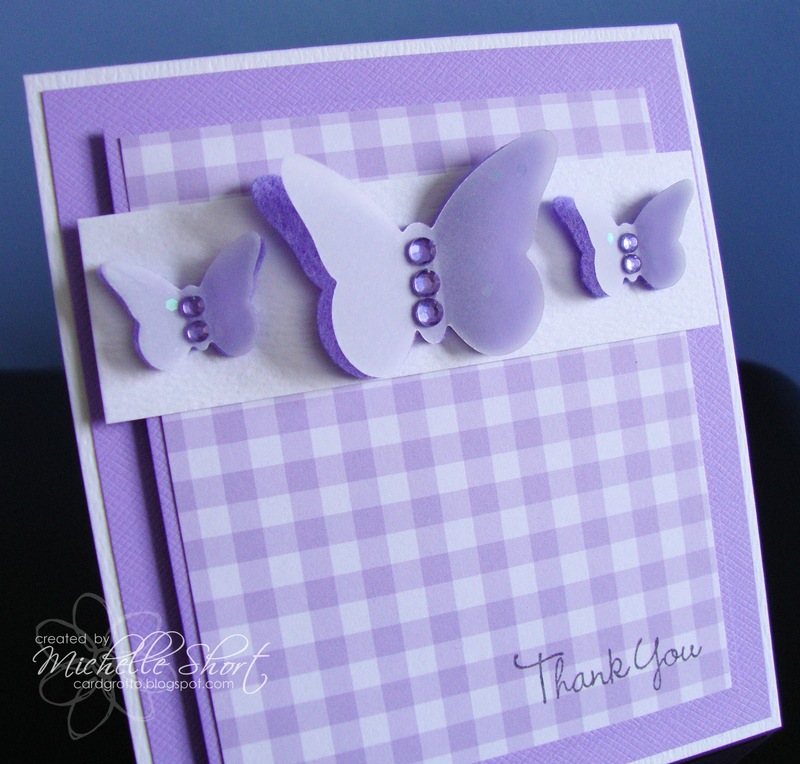 Perfect pairing of the gingham paper with the butterflies! And the butterflies are incredible! This is a beautiful card, so clean and fresh looking. I saw it on the ‘A Load of Old Pickle’ blog and followed the link, so glad I did, there are lots of cards here to inspire me. Your cards aren’t overly ornate or cluttered, just clean, simple and effective. I see you were an Elzybells designer, Elizabeth produced some lovely stamps and I miss them for their simplicity and humour. Websites comes and go but that one I always remember fondly. I also read your post about your present problems and wanted to send my good wishes along with the many others you have received. What a wonderful card Michelle. Your cards are always special! Absolutely gorgeous card!!! I love purple! Thanks for sharing your craft room organization, lots of ideas there! I just added you to my blog following list. Found you at the Clean and Simple Blog.